My £280 Bosh you can open the whole door and add to the wash, are these worth the price ? I see where you are coming from but 5 year warranty parts and labour! Yes they are worth it. I think it was a slightly different model number, and it was £399 and an extra £20 with code. I think it was a slightly different model number, and it was £399 and an …I think it was a slightly different model number, and it was £399 and an extra £20 with code. It must have been just a washing machine than a washer-dryer.... Thanks anyways.. It must have been just a washing machine than a washer-dryer.... Thanks …It must have been just a washing machine than a washer-dryer.... Thanks anyways..
Now you mention it, I think it was just a washer, not wash/dry. Don't you just love people that contribute NOTHING to the site or comments - that come in with lack or reading skills and give useless information. I've adapted my non Add Wash Samsung by removing the glass door and fashioning one with a door with hinges out of wood. It leaks a little bit, but I've saved a fortune. 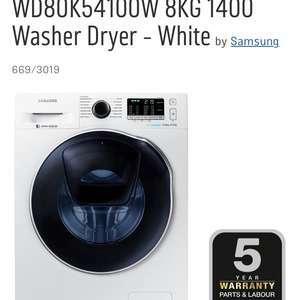 Do Samsung do any good intergrated machines? How do you get it down to 532? Yes the dryer works if you use it correctly most people don't though then complain the dryers useless. As it's an A rated dryer I'll be honest it takes ages compared to my old machine. Also many people forget they need to lessen the load when drying if washing at full capacity so the 12kg washer will only dry 8kg effectively. I've had my 12kg one since April 2016 not add wash though and have no complaints. Got mine at a bargain price though and not seen it anywhere near that price since.